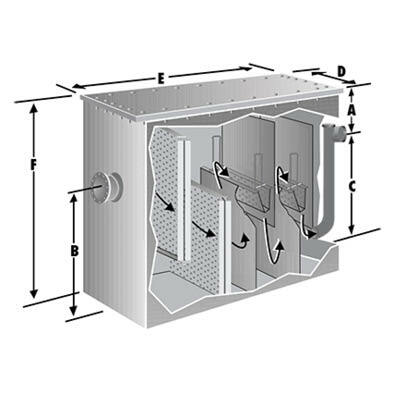 Heavy Duty Commercial Lint Separators shall be Rockford Lint Separators as manufactured by Rockford Sanitary Systems, Inc., Rockford, Illinois, and as noted on plans. Furnish ______Rockford Model RLS-______ all-welded 1/4" steel separators ______" tapped inlet and outlet with tapped ______" internal vent connection, visible double-wall outside trap seal, easily removable stainless steel filters for cleaning, removable 3/8" nonskid diamond treadplate cover(s) for flush-with-floor installation suitable for pedestrian traffic, sealed with heavy-duty leakproof gasket, secured with stainless steel flat head screws, OPEX® Shop Coat coating inside and bituminous coating outside for flush-with-floor installation. OPEX® Shop Coat coating outside for on-the-floor installation, aluminum cover(s), anchor flange with or without clamping ring, integral extension to grade, epoxy coating, all stainless steel construction, double-wall construction. Cover(s) fastened with stainless steel vandal-proof bolts. Contact our Engineering Department. • 6" & larger - companion flange connection.